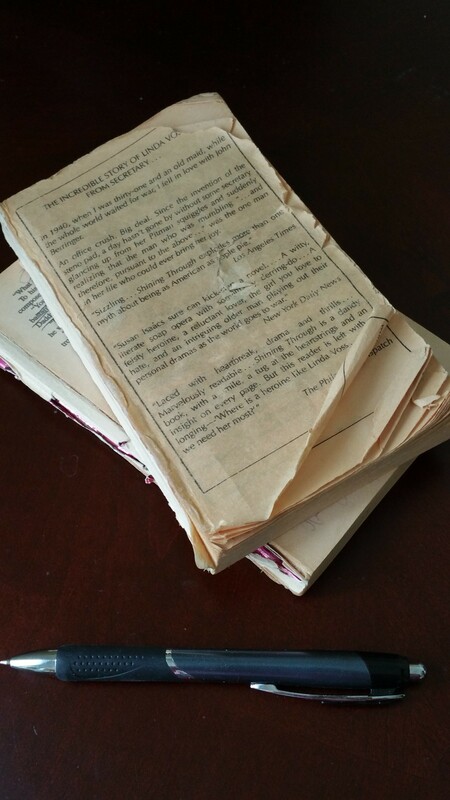 Every avid reader has one–though maybe not as dog-eared, binding-cracked and scribbled-in as mine. I call it the desert island book. It’s that one tome you’d want with you (The Bible and the dictionary don’t count!) if you were stranded on a desert island and had only one thing to read. For me, that particular honor belongs to Shining Through by Susan Isaacs. It’s one of those big, juicy, ’80s stories about a secretary who falls in love with her married boss and then goes into Nazi Germany undercover during WWII. I can still see myself, way back twenty-something years ago, standing in the supermarket and reading the first page. Totally hooked. I thought, Wow! This is what a good pop novel should be. It read so fast and so funny and had such heart I wished I’d written it myself. I knew I had to buy it, then and there. After I took it home, and read it about a million times, I marked it up. I took it apart — figuratively at first, then literally — wondering, How did the author know what part was supposed to come next? One of my favorite observations about writing goes like this: An author always has to deal with three separate stories. There’s the one in his head, then the one he gets on paper, and finally the one in the reader’s imagination. Well, I’ve been wrestling with the first two for a long time, and now it’s exciting to finally get the third piece of the puzzle into place and complete the picture. Hearts and smiley faces to you if you click the link and sign up for my email list. You’ll be the first to receive news about future releases, giveaways, special offers, books by other authors, and more. To discover my current releases, check out my Books tab.